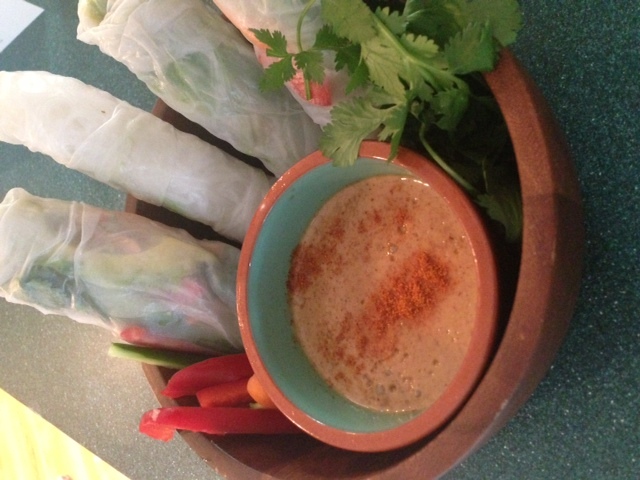 Continuing the kids-can-cook (minus 3 minute noodles)-no-oven series, I am happy to share these fresh summer rolls with basil, avocado, kale and almond sauce. The recipe requires some time to chop all the fresh veggies and cook the noodles (only 3 minutes), which I did in advance. I also made the to -die-for almond sauce at a separate time. Spacing out the steps, keeps me from feeling overwhelmed about the somewhat complex recipe. 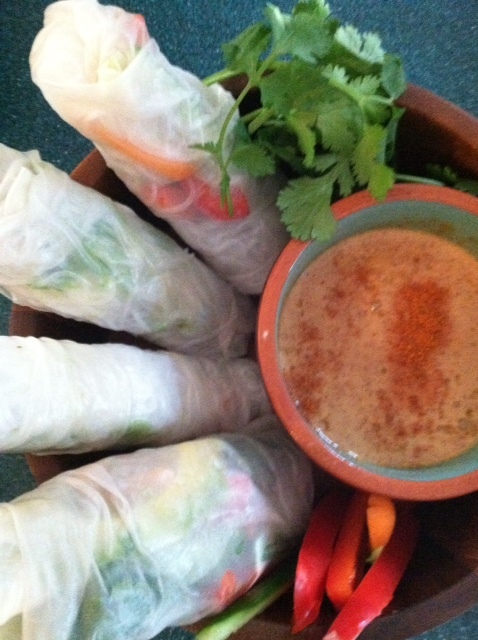 Before we ate dinner I had the kids and my husband come in the kitchen as I demonstrated soaking the rice paper and then placing the noodles, vegetables and herbs on top and rolling like a burrito. The kids loved choosing what their fillings were and eating the delicious and fresh treat. The best part was the almond sauce. We could not stop dipping anything we could find (including our fingers) in the garlicky spicy sauce. These are great for entertaining as you can make in advance and serve cold or room temperature. 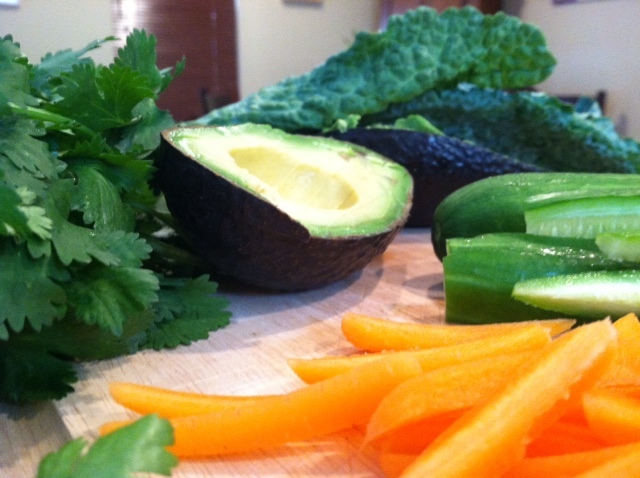 To make the wraps: cut all the veggies into thin strips. 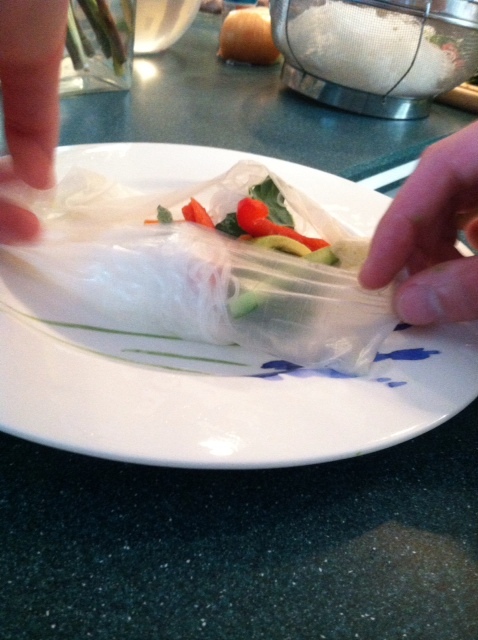 Dip your rice paper sheets in warm water so they soften and become pliable (do this one at a time), then arrange your fillings in the middle. Fold over two ends and then wrap it up like a burrito, making it as tight as possible. It might take a few tries to get it perfect. Serve with the sauce and enjoy nature's elegant beauty.